Final Fantasy XV feels like a Final Fantasy meant for this time and age. It overcame the linearity of previous installments and leapt over the limitations of traditional JRPG games by honing in on action-based combat rather than the all too familiar turn-based. It finally opened its exclusive anime-nerd doors to action-adventure fans while remaining true to the scope of the Final Fantasy universe. But what consistently frustrates me every single time I return to it is that its story is a fragmented experience that requires an abnormal amount of investment of time and money to get it in its entirety. I am, admittedly, a rabid Final Fantasy fan. I did my waiting, ten years of it. I have invested in this game. I bought the $90 deluxe edition with the steelbook and Kingsglaive film. I bought the $25 season pass because the collector’s edition and deluxe editions didn’t come with it. I bought the $8 monthly subscription to Crunchyroll to watch the anime. I even bought the $30 collector’s guide and the stupid $6 limited edition dreamsicle Jones sodas from Target (which were very delicious). These fools got me hook, line and sinker for this game. I stopped playing when I realized that I couldn’t go back to defeat the Adamantoise after I ran away the first time and didn’t feel like doing a new game plus for one achievement. It wasn’t because I was necessarily lacking any information. Your girl has got it all, clearly, and my checking account hates me for it. But here’s where it flops: What if you didn’t invest like I did? You’re missing out on significant story elements from the movie and the anime. I’m not going to spoil what happens in either of them, but you need to know that the movie gives context to the attack on Insomnia, which is completely glazed over in the main game (even though it’s the spark that lights the fire of the plot) and the anime gives context to the characters that you’re going to be spending at least 30 to 40 hours with to complete the main storyline. Even parts of the DLC chapters rely on minor context these other two experiences provide. Square’s idea of providing extra experiences for long-time and new fans was great in theory. A CGI film, five-episode anime, three major DLC chapters, two mobile games and a VR experience have been planned to release alongside the main game. We’re coming up on a year of this game being out, and we’re only about half-way through that. Which is fine—it’s great to have a steady stream of content to keep a game like this relevant. And that’s not the only occasion. The game consistently jumps to major plot points without filling in the gaps or explaining the motivation behind the character’s actions. Ultra-badass mercenary Aranea is the enemy at one point, but by the end of the game, she’s totally chummy. Fast-forward a bit and somehow Prompto is a Magitek? Where was the build-up to this? Where was the “Surprise! Your friend wasn’t what you thought he was the whole time!” rollercoaster? And how about that time skip? Why was that even necessary? Seeing my friends ten years older doesn’t make me love them any more than I already did, and the jump didn’t make me feel bad for making them wait. Quite honestly, I pity them. Noctis is not an angsty anime boy worth waiting for. Many of these holes are filled eventually, but only in content that isn’t part of the base game. Episode Gladiolus explains where he ran off to half-way through the game. Episode Prompto explains his origin and why Aranea decided to get cozy with the boys. I assume Episode Ignis is going to explain what happened to him too. This is all fine and dandy, but why couldn’t these things have been explained in the game itself instead of just thrown at us randomly with literally no other explanation than, “oh yeah, this happened”? The point is, you don’t get answers to these questions unless you invest. Yes, it’s optional, but it’s also not. It forces a sale. The base game only ever goes halfway, and will never give you the full answer because it wants you to invest. That’s almost as bad as Azura’s Wrath’s $6.99 “true ending” DLC ridiculousness. It’s lazy, and it’s deceptive. If I’m paying ~$100 for an epic tale of brotherhood and monster-slaying beyond measure for it to have as many holes as it did, I don’t want to pay for band-aids. I want my extraneous experiences to add to the game and its lore, not plug up the holes and expect that to be ok.
There’s a huge difference between providing additional content and providing necessary content. 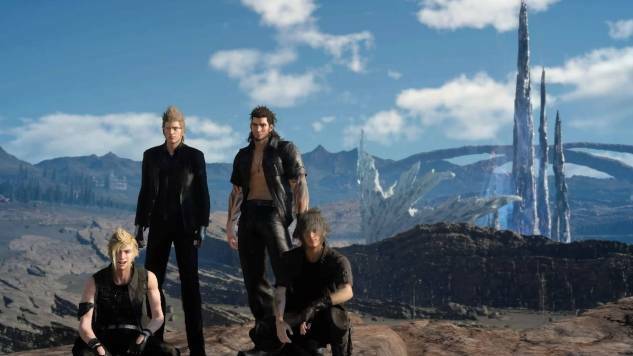 Final Fantasy XV makes its “additional content”—the movie, the anime, the DLC—necessary. The only genuinely additional content here is the silly merch and the god-awful kingdom-builder mobile game that just released. That stuff actually adds to the atmosphere and gives rabid fans, like myself, something to hold onto. It’s content that isn’t integral to the actual story—it adds another element to it. Probably one of the better examples of this is Skyrim’s DLC storylines Dawnguard and Dragonborn. These both added new context to existing parts of the lore, but weren’t meant to address questions that weren’t being answered. It doesn’t try too hard to be metaphorical and mysterious or edit what it already said, but rather opens up a new chapter of the lore and provides clarity to an already very complicated and convoluted story. With Final Fantasy XV Square handed me a puzzle I desperately wanted to put together and cherish like I have other Final Fantasy titles. The problem is, they took away those small pieces in the middle that contribute to the larger picture. A puzzle isn’t finished if there are still gaps and missing pieces—it undermines the whole reason why you spent so much time putting everything together. By splitting its story up this way, Final Fantasy XV similarly undermines the time you spend learning about this world and its characters. I wanted to be able to take all of those little pieces, glue them all together, put them on my wall and say “look at this thing I fell in love with, let me tell you about this adventure I went on.” But I can’t. I just can’t justify exalting a tale that is missing so much.